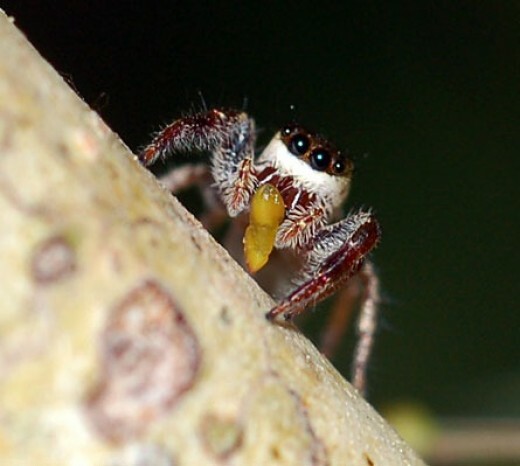 Central America: A vegetarian jumping spider called Bagheera Kiplingi has been discovered in Central America. B. Kiplingi is rare among the world’s 40,000 spider species, most of which are predators feeding on insects and other animals. “This is really the first spider known to specifically ‘hunt’ plants; it is also the first known to go after plants as a primary food source,” said Christopher Meehan from Villanova University. About the size of a person's pinky nail, B. Kiplingi feeds on the acacia plant. It uses hunting strategies to get past ants guarding the acacias from other herbivores. In return, the guard ants get a comfy place to live in the plant’s hollow spines while it eats acacia nectar and the shrubs' leaftips. B. Kiplingi spends its entire life on the acacia shrubs, so guard ants are always a threat. When hunting, B.K. changes targets when approached by an ant and uses silk droplines as retreat ladders. The spiders usually nest on the ends of older acacia leaves, the areas least patrolled by the ants. Direct observation, video recordings and chemical analyses of such spiders suggest the animals get most of their food from plants. In the Mexican population, about 90% of the spiders’ diet came from plant tissue, with the rest made up of ant larvae, nectar and other items. In Costa Rica, where a B. Kiplingi. "cousin" lives, the spiders got about 60% of their diet from acacia plant tissues. When the spiders do hunt ant larvae, they mimic the ants’ behaviors, for instance by making jerky movements, to get to the food.